Lynden SHIELLS passed away peacefully on January 14, 2019 at Yorkton District Nursing Home with his family at his side. Lynden was born on June 28, 1923 on the family homestead at Steep Rock, Manitoba. Lynden was second youngest child to Clara and Walter SHIELLS. He was raised on the homestead in his early years, later moving to the small hamlet of Steep Rock. During his younger years he was active curling, playing baseball, fishing and doing woodwork. He graduated from High School at Steep Rock. 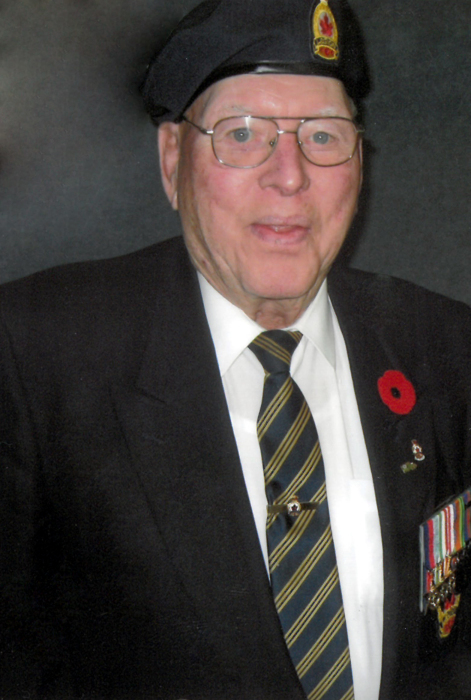 On April 1, 1941 he enlisted in the Armed Forces serving with The Royal Canadian Medical Corps until January 28, 1946 serving throughout United Kingdom, Central Mediterranean area & continental Europe, receiving many medals for his service to our country. On his return to Canada he became employed with Canada Cement Lafarge and remained in Steep Rock, Mb. until his retirement. On Nov 30, 1947 he was united in marriage to Sheila Durrant in Steep Rock. They made their home in Steep Rock and were blessed with four children, Barry, Carol, Heather and Glenda. While working for Canada Cement, and raising his family he remained very active in the community. He was president of the local legion #235, played ball, fished, curled (always attended the men’s annual provincial bonspiel in Winnipeg). He had built his house and his carpentry skills were always sought throughout the community. He assisted in the construction of the church and always helped his children with any building projects. After retirement he enjoyed living adjacent t o Lake Manitoba and could always been found fishing within walking distance of his house. In October 2000 he and Sheila moved to Yorkton, Sk., were they were closer to family. After moving he continued to enjoy watching hockey, curling and spending time with great grand children. Lynden was predeceased by this parents Walter and Clara SHIELLs, daughter, Carol, Grandson, Scott. He is survived by his loving wife Sheila of 71 years, son Barry, (Cathy), Heather (John), Glenda (Tracy). Granddaughters Jennifer (Ivan), Andrea (Clint), Kirsten (Chris), Christine, grandsons Mark, Corey (Brenda) and blessed with 17 great grandchildren. Lynden Shiells, age 95 years of Yorkton, husband to Sheila Shiells, passed away on January 14, 2019. A family memorial service will take place at a later date with interment in Steep Rock, MB. Should friends so desire, donations in memory of Lynden may be made to the Alzheimer's Association.